Perfect for a shabby chic or vintage wedding. My book page confetti cones are made with love using the pages of an unloved book. Perfect addition to a shabby chic or vintage wedding. 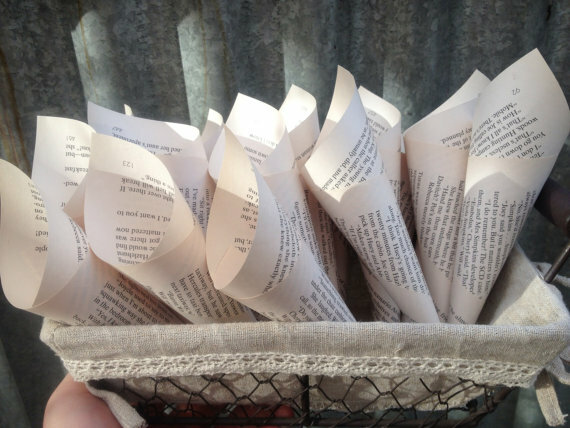 100 vintage inspired, gorgeous handmade book page confetti cones to enhance your wedding. These have an approx measurement of 18cm x 5 cm, due to the handmade nature there can be slight variances. Will be a spectacular finishing touch to the magical moment when the confetti is thrown and will look amazing in the photos with all the guests holding them, especially for a vintage or shabby chic wedding! These are hand folded then glued to ensure durability and there are some colour variances between book pages depending on the age of the book used. These can be filled with lavender flowers, confetti, birdseed, whatever suits your taste. I have other quantities listed in my store and will be happy to provide you with a custom quantity should you desire. Please support me by sharing this on your favourite social media channel.